Today’s European financial markets hardly resemble the ones from 15 years ago. The high speed of electronic trading, explosion in trading volumes, the diverse range of instruments classes and a proliferation of trading venues pose massive challenges. With all this complexity, market abuse patterns have also become egregious. Banks are now shelling out millions of euros in fines for market abuse violations. In response to this complex world, European regulators thus have been hard at work. In this webinar, we will discuss how compliance teams are fighting back with Big Data and trying to stay out of regulatory hot water. Rapid response to suspect trades means compliance teams need to access and visualize trade patterns, real time and historic data, and be able to efficiently perform trade reconstruction at any point in time. 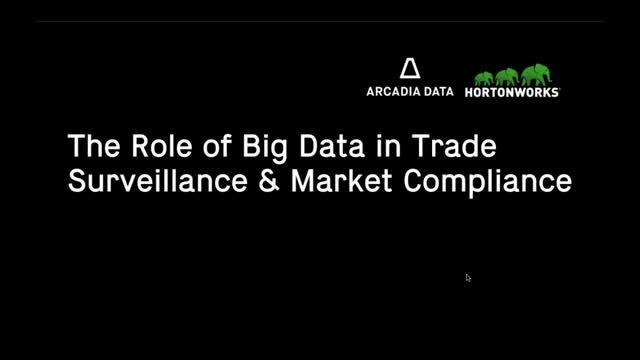 Join Hortonworks and Arcadia Data for this live webinar on 22 November at 14:00 GMT, where we’ll cover the use case at a Top 25 Global Bank who now has deep forensic analysis of trade activity.